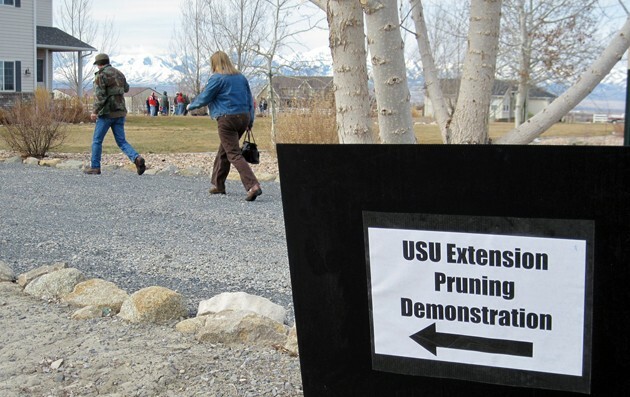 Free hands-on pruning demonstrations were available at last Saturday’s Spring Expo. Before we get “down to business” this week, I want to mention how enjoyable the Spring Expo was last week and how great it was to meet many of you in person. I enjoyed hearing from you and your comments about how you enjoy this column that I, and sometimes my best friend, Maggie, get to write each week. It’s an enjoyable thing to share the hands-on gardening lifestyle we get to enjoy with you. Conveying practices and knowledge about a range of topics certainly works to keep us sharp, simply because you can’t throw out hearsay about gardening and landscaping practices in the newspaper. No, it’s gotta be vetted. So, we get to read a lot of material, on a lot of subjects, that provides “backbone” to what we pass on to you. That’s a good thing. We hope it’s as enriching you as much as it is us. The Garden Expo was a winner. It was well-attended and there was some great information passed regarding a wide range of topics. Kelly Kopp did a masterful job of expanding our knowledge of the grasses that are most successful for recreational and ornamental spaces and explaining why certain things work the way they do. “Hats off” to Joyce Tate and her team on another great event. With that, let’s get to a subject that is important, especially this time of year. It’s my preference to do most of my pruning, especially on fruit trees and grapes, in March or April. There are other successful orchardists and fruit-growers that prefer to do their pruning in the fall after leaves drop. 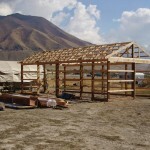 It’s still relatively warm, and getting ahead of this task before retiring for the winter certainly has its allure. Some of us love to prune. To others, it’s a chore. This much I can promise you: if you don’t practice good pruning approaches, you won’t get nearly the positive results that you could. This applies to both fruiting trees and berries, as well as ornamentals. You see, this is a collaboration we enter into with the vegetation that graces our yardscape. Plants of all kinds, given a choice, want to flourish. They will do what they can do to adapt and maximize the resources that are available to them. Given a moderate amount of care to meet their needs, they will do quite nicely to fit in and grow in a way that best fits their immediate and future needs. But they aren’t the only actors on the stage. There’s YOU. You are also working to attain certain things, including sight lines, focal points, spacing, air movement and windbreaks, bloom, and productivity. A landscape, even with good irrigation, adequate fertility and sunlight, will not be optimized without your intervention in the way of cultivation and pruning. Pruning is the focus of our conversation today. Like many things that need to be done, there’s a bit of delayed gratification. When you prune, you don’t immediately see the desired results, but you will later in the season and seasons to come. Also, doing a moderate amount every season is a much better and less taxing approach than doing massive amounts of pruning every few years or so. But, why does pruning have to be done at all? Why not just let all the plants and trees “do their thing?” Why do we need to intervene? Perhaps a metaphor will help us here. When you are learning something new, or working to increase your skill in a craft or sport you are currently part of, you can only self-inform so much. You need to broaden your scope, including consulting outside experts, and sometimes, coaches. The coach can take us to greater levels of accomplishment and mastery than we typically can for ourselves. There’s a loose analogy here. We can take the natural inclinations and desire to thrive of our plants and help them perform at a higher level than they could by themselves. A couple of examples come to mind. First, most plants and trees will put on more stems, leaves and branches than they need to thrive and this overproduction competes for sunlight or space. Overgrown conditions can occur easily, as well as inward and low growth on trees that diminish our enjoyment of yard space. A common mistake is to not establish a bottom horizon line for trees. Without this, a tree can look simply like a large shrub. Removing the lower branches opens up the space underneath, makes it easier to walk by or under, and gives better visual proportion to the tree. Inward branches are usually created because the plant wants to fill in available spaces in the center. The problem is that the plant gets “woody” with large weathered and aged (and sometimes, dead) branches, and leaves drop off in the middle. And no wonder, they are over-shaded by other leaves. It’s been estimated that an average single leaf blocks 90 percent of the sunlight. That doesn’t leave much light for leaves growing under a thick canopy. The plant responds by shedding the leaves in the interior. Usually, this is not very attractive. So, prune out about a third of the interior of a plant each year, staggering the cuts both near the base and half to two-thirds up in the plant. Tip off only a few of the tops. Avoid “topping” the plant (I call this the ice-cream cone cut. 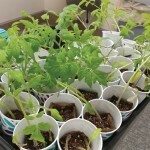 ), as you will only stimulate lots of new shoots at the top. It is ugly and unnatural looking. One of the things that you’ll find with practice is that the tree or shrub WILL react to your pruning cuts. That’s a sure thing. 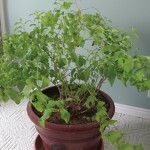 You’ll discover that you can revitalize an older shrub by removing some of the main branches down lower in the plant. New, green shoots will form. A branch going in a direction you DON’T want can be cut off just above a shoot pointed in the direction you DO. Later in the season, you’ll see a new stem heading the direction you wanted. As for fruit trees, they will almost always produce more branches than needed, and attempt to grow more fruit than is possible or healthy for the tree. Almost all fruit trees can benefit from annual spring pruning (and some light summer touch-ups as well). For fruit to be plentiful, lots of sunlight needs to reach the interior of the tree, and air needs to move through easily. To get the proper amount of fruit, that is sizable and sweet, you need to thin the fruit shortly after it sets and the blooms drop off. A good rule of thumb is to leave the equivalent of a piece of fruit every six inches on the bearing tips. More than that, and the fruit will not size up, not be as sweet, and will likely be too heavy for the tree to support. Broken branches, including fatal splits to the center trunk, are too great a risk for the promise of a few more pieces of fruit. It’s no accident that we’ve put our attention on pruning this week. You’ve learned several principles from reading today’s column, but if you’d like to commit this to “muscle memory”, you need to see how this works in an actual yardscape as well as doing some of the actual pruning yourself. There will be a hands-on pruning demonstration at our home in Erda on Saturday, March 11 from 9-11 a.m. Check out the announcement in the Bulletin Board section to get more information and our address. My friend Linden Greenhalgh and I will show you how to prune a variety of orchard trees, as well as raspberries, blackberries and grapes. Bring your pruners, gloves and layered clothing so you are prepared to go to work as well as be comfortable no matter what the weather brings. We’ll see you here Saturday.